Kolkata has been described to me as ‘full on’, a city that is in your face. Crowded, dirty, noisy – hmmm, it’s not sounding very appealing so far. But add that it is the statuesquely declining seat of the East India Company, the former second city of the British Empire, and it immediately becomes more intriguing. Then there are some magic words: ‘It’s like stepping back in time to the Sixties.’ I’m in – l love going anywhere that is like stepping back in time where I won’t assaulted by rap music or Angry Birds t-shirts. When I arrive I find Kolkata is a bit ramshackle – which I was expecting – and drivers use their horns way too much. The noise and the traffic are a little wearing, but looking beyond the inevitable mess, I think it’s quite a pleasant city. The British left nice wide roads and plenty of august buildings, and it has parks. At any rate, it seems to function better than Mumbai. There’s not a lot of tourist infrastructure here. I am stared at with big wide eyes all day long, everywhere I go. What there is a lot of is colonial architecture: street after street of fine buildings, along with hundreds of rather grand Anglo-Indian apartment blocks. I keep thinking if some of these buildings were in Melbourne or Sydney, they’d be redeveloped as prestigious addresses. There are surprises around every corner. Many of them are neglected and not in their prime, but Kolkata must have once been a very fine metropolis – at least in part. 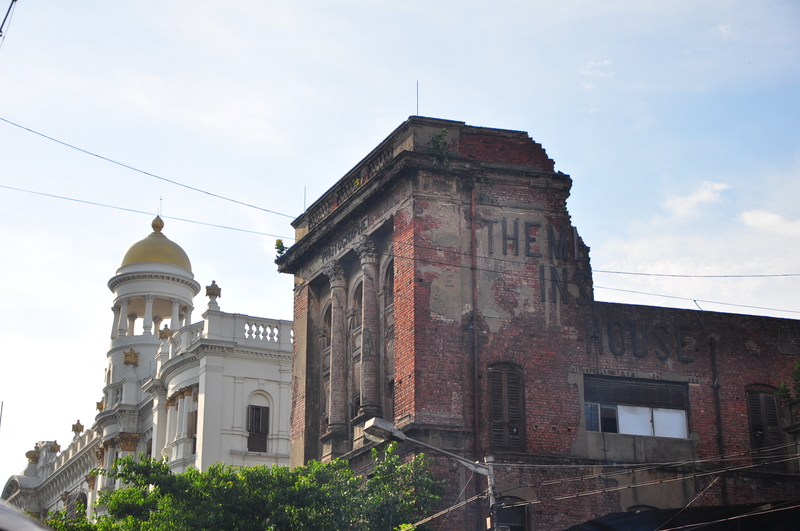 I really want to go back about a century to 1910, when the British Empire was still tootling along at full throttle and Kolkata was a thriving centre of trade, when Kolkata was in many ways a hot, Asian version of London. I’m not hugely impressed with the accommodation on offer though – I looked through a few guesthouses and dingy is the word that comes to mind. For the same price you get far less grubby accommodation in Bangkok or Penang. Muddy streets don’t bother me, but I like a clean bed. Ending up in the ‘backpacker ghetto of Sudder St, in despair I turn to a place Lonely Planet recommends called Ashreen. Except I have to go to the co-managed establishment across the street called Afridi, which as the guide book points out is ‘far less impressive’. And it is. The building is in need of love and attention, though at least the bowed wooden staircase isn’t as scuffed and crumbling and dark as the forbidding entrances of some guesthouses that look as if they are portals to death for the destitute. My room is like a small dungeon with one fuchsia-pink wall and a bathroom cubicle. It has no windows, but at least it’s quiet. I can’t bring myself to take off my shoes in there, but on the plus side, there are no insects in the bed. Well, I didn’t think there were, though I did acquire some strange itchy bites just to put me back in my familiar discomfort zone. When I am shown to the room, my attendant assures me there will soap, hot water, towels and toilet paper. ‘Is there really hot water?’ I ask. ‘Oh yes yes,’ he assures me. It doesn’t. I do get a towel but nothing else. In the morning, we are not happy, because I am washing my face and the water trickles to a halt. I want a shower and I want to get the soap out of my eyes. When I gather up enough drops to regain my vision, I put on some clothes, trot across the street and enter into a long and circuitous exchange with Ramiz, the manager, who says it’s not his problem I couldn’t have a shower because he didn’t know about it and I should have told him. Well I am telling him now, what was I supposed to do? Run over naked? Then he says I should have phoned, though then he remembers my little dungeon doesn’t have a phone. He doesn’t need to know about Kolkata, just knowing a little more about Ashreen Guesthouse and its slobby brother would do. I point out this may not be the most luxurious establishment in the city, but water is a fairly basic service in a room with a bathroom cubicle, though Ramiz doesn’t seem to think so. He makes a quick phone call and tells me that there is water. There isn’t: I take another caretaker up there and he can’t make the shower work either. ‘It’s not working, is it?’ I say to him. He agrees it is not. Later I tell him that again, there is no water. I’m not complaining, I add, but I really think you need to do something about this. He agrees, at least in theory. I am definitely hot and itchy now, but at least I am right. I am so right, that when I return to Ashreen reception some hours later, Ramiz actually apologises and gives me 50 rupees (about 80 US cents compensation). The money is piffling, but I do have a sense of wellbeing that comes from victory. As water is elusive, eventually I move to a better room. And I am very grateful for a room with water after I vomit a kati roll into a gutter on Chowringhee Rd. My first kati roll (a fried paratha roti with chicken and veg filling) was fine, the second one put my digestive system into a right state. Apparently now Ramadan has started, one must be careful of food sitting around during the day. Don’t eat off street places I guess, I love street food but with some places even I refrain. Ouchies, that’s sad. I remember a similar incident happened to me during my last trip, I had amazing chicken from a restaurant near my house and it was all rainbows and sunshine, the second time I did the same thing except it wasn’t rainbows and sunshines but a painful torment! i spent a year in India, the chaos is to be embraced.i love their resourcefulness and think that in the west we can look to such countries and take inspiration from all facets of their lifestyle. Currently looking at their veggie diet and will shortly be releasing an article on my web-site, shedreamsingreen.com . eating less meat can save the world. I think a lot of people could do with eating less meat, but do you think the Indian vegetarian diet is balanced? I was served too many meals that consisted of rice, bread and potatoes and while the lack of meat didn’t bother me, it was too much of a carbfest for my liking.